Visitors to the Frick Collection in New York City will likely be familiar with the magnificent Self Portrait (1658) of Rembrandt that hangs in the main gallery. The artist presents himself as an imposing father-figure, like some patriarch of old. His dress is formal, and utterly distinctive – a gold apron, a red sash – while his prominent and imposing hands proclaim his trade. And yet beneath that intimidating, almost royal, exterior is an unmistakable vulnerability, a strength borne of having suffered life’s calamities, and emerged from the awful trials that the world inflicts upon one and all. 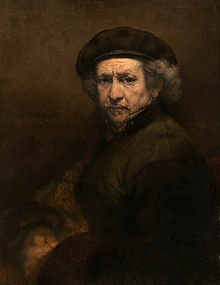 The Frick Collection is currently hosting a show focused on a handful of smaller but no less breathtaking works by the Dutch master, Rembrandt van Rijn (1696-1669), devoted to certain events in the life of another patriarch, Abraham – progenitor of the Jews and acknowledged father of the Abrahamic religions, Judaism, Christianity and Islam. The crown of the show is Abraham Entertaining the Angels (1646), which depicts the story of the foretelling of the birth of Isaac to the elderly couple Abraham and Sarah: “The Lord appeared to [Abraham] by the terebinths of Mamre, as he sat in the door of the tent in the heat of the day” (Genesis 18:1). Abraham is ninety-nine years old, and it is only a few days since his circumcision. Though still physically recovering, he sits at the entrance of the tent to see if there is a passerby whom he might take into his house. Abraham, we are told, lifted up his eyes and saw three men standing near him. In Jewish commentary, these were angels – specifically, Rafael, Gabriel, and the greatest of them, Michael – in the form of humans. According to Rashi, one was to announce the birth of Isaac to Sarah, one to destroy Sodom, and one to heal Abraham, “for one angel does not two errands.” Christian apologists wanted to view Abraham’s heavenly visitors as an Old Testament allusion to the Holy Trinity. Rembrandt seems to weave between Jewish and Christian exegesis, and in the process, charts a course of his own, developing a distinctive interpretation. The painting, oil on oak panel, offers us a kind of progressive revelation. The angel whose back is to the viewer reflects only the slightest degree of light, his wings are folded and tucked behind him, and his bare feet protrude from under his garb, giving him the appearance of an ordinary traveler. The second angel, whom we see in profile, reflects more of the light received from the incandescent being at center. His wings are not fully unfurled but beginning to stretch out. Only with the third celestial visitor, whose face is to us, do we have a glimpse of the divine per say: he is clothed all in white, and he radiates a luminous glow, the light accumulating in the folds of his gown; while his wings, unfolded and outstretched, affirm his deific stature. Abraham’s firstborn son is Ishmael, whom he fathered with the slave Hagar. Rembrandt’s 1637 etching of Abraham Casting Out Hagar and Ishmael, depicts the scene in which mother and son are banished as a consequence of Isaac’s birth. In Chapter 21 of Genesis, Sarah tells her husband to expel Ishmael and his mother from their home; and ultimately God will speak to Abraham and command him to do as Sarah says – reaffirming the promise made earlier that his son Isaac will inherit his covenant, while Ishmael will also become the father of a great nation. Sarah smiles with satisfaction as the forlorn Hagar makes her way, a sturdy young Ishmael by her side; and almost regal Abraham stands inactive on the threshold of his lavish home, outstretched arms underscoring his subjection. An etching, Abraham Caressing Isaac (ca. 1637-45), does not depict a specific biblical episode. This is a different Abraham than the one that cast out Hagar and Ishmael. No magnificent finery: this is a more modest and rural Abraham. He fondly holds the boy Isaac, while on his brow we can see the pensiveness, the somber and searching gaze of the father who will be commanded by God to make a sacrificial offering of his son. The Sacrifice of Isaac (ca. 1652-54) is a startling work for the terrible violence it brings into focus. Abraham covers the boy’s mouth to stifle his cries, but his eyes are left open to witness the knife. The father is apparently unaware of the angel above him, senseless to the angel’s hand on his head. Abraham has become as pitiless as the command he’s obeying – and it is precisely that obedience, that complete and utter preparedness to go to the end, which is truly frightening, inasmuch as it has become so very real. Rembrandt’s etching of the Sacrifice of Isaac (1655) strikes a very different tone. The emphasis here is on Abraham’s inwardness, his inner conflict. Now the father covers his son’s eyes, and draws the boy’s head to his own body, a small but significant gesture of comfort, far removed from the harrowing filicide of the earlier drawing. Isaac calmly bares himself, innocently submitting to the knife, while Abraham, apparently insensible of the angel that his holding him from behind and staying him from the deed, fixes his darkened eyes on the ram that will replace his son as the burnt offering. The angel’s face is close to Abraham but remains unseen by the patriarch, who listens inwardly rather to the unknown voice. Rembrandt’s Abraham reveals a complex and emotional engagement with the story of the patriarch. The artist’s understanding of his Biblical subject was anything but static: his drawings, etchings and paintings are evidence of a searching, questioning orientation – an openness to readings that acknowledge the burden of faith, the trials of fatherhood, and the ineradicable mystery of being.